I am am Artisan, Polymath, fabricator and manufacturing facility owner that can make almost anything you can imagine. 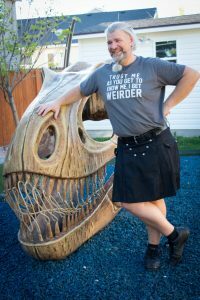 I have designed home theaters and fabricated over 45 dinosaurs for the Eccles Dinosaur Park in Ogden. I have made unique furniture and complex lift systems. I have a variety of skills that encompass the whole of the creative process. I have built my business and life philosophy around making unique items for public and private commissions. If it can be rendered or imagined, I can make it. I have cross-discipline experience in art, design, and industrial work. I enjoy problem solving and learning new techniques. I also enjoy making the first of it’s kind and own MK1 Studio with the philosophy that I make the Mark 1.